The ERR (Earth Resource Regeneration) Advisory System was developed by the Bureau of Harmony as part of a series of initiatives to improve coordination between Bureaus of the Ministry of Reason in relation to, and inform citizens about, the sustainability of current sector behavior. With the Ten Fundamental Orders as guideposts, the Bureau of Harmony monitors countless depletion metrics, compares them against planetary metabolic algorithms, and compiles a single “current impact status” for the sector. 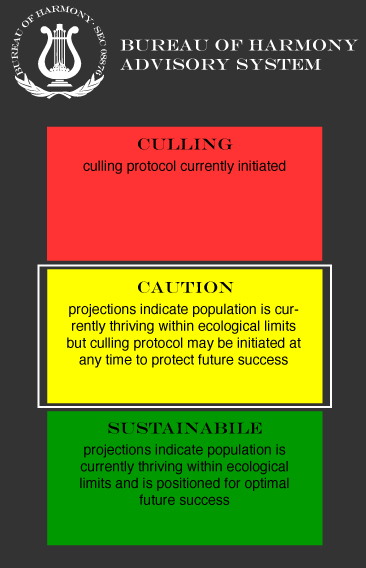 In this way, the advisory system is the foundation for building a comprehensive and effective communications structure for the dissemination of information regarding the risk of anthropogenic environmental catastrophe for present and future citizens. Check back here frequently and follow The Bureau of Truth for announcements about changes to the current ERR Status.